One year ago today, Nicolás Maduro was elected President of Venezuela. One year ago, Henrique Capriles was elected President of Venezuela, and Nicolás Maduro stole the election. It’s safe to say that each and every Venezuelan believes one of those two things. Venezuela’s drama is that each one of the camps of believers is extremely large. With everything that has gone on since, it is easy to forget what preceded the April 14th election. After Hugo Chávez died and millions participated in a cathartic funeral, an election was called. It was supposed to be a mauling for the opposition. 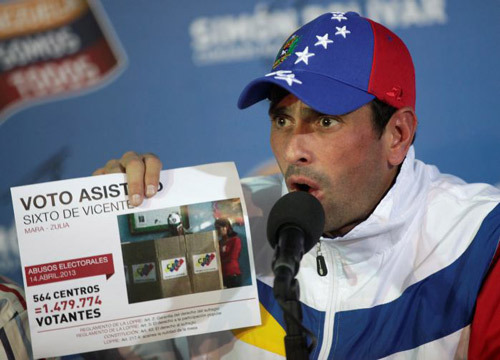 Henrique Capriles had to be convinced to even participate. In a rousing speech, he accepted the nomination, and with few resources, he embarked on what seemed like an suicide mission. We weren’t convinced by the campaign, but Venezuelans sure were. What followed was a bizarre campaign where chavistas went crazy – and we mean red-balloons-and-a-big-check-up-to-the-sky crazy – while the opposition, playing with nothing to lose, practically won. It was the tortoise and the hare, with the hare winning by a hair by moving the finish line right at the very end. Elections are supposed to settle things, and this one settled something alright: politics in Venezuela would never be the same again. Venezuela has been reeling ever since. The opposition is basically split between two camps: those who believe we were robbed, and those who believe we were robbed but we shouldn’t say so too loudly. As Quico put it, the opposition had to decide “between being cannon fodder and passive acquiescence.” Right now, they are both. The close, disputed election meant that the opposition felt emboldened. The election gave them the energy to take the fight to Maduro, and we are seeing its consequences now. More than the theft of the election itself, the fact that chavismo could not steal it for more than a percentage point or so made the opposition believe, for the first time, that chavismo had reached a terminal state. The barricades we see on the streets are a direct consequence of an election that settled absolutely nothing – except the end of Venezuela’s long cold civil war. The media talks about the upcoming elections in India as the longest, most complicated democratic election in the world. Funny – we Venezuelans have been trying to elect a President for a year now, and we’re still going at it. On April 9th, Emiliana hailed how the campaign simply felt different. She talked about the newfound confidence in the opposition, about how it was no longer afraid to take the fight to Maduro and chavismo. Oh Emiliana, how right you were.